7 Sunshine Coast Marathon & Community Run Festival is proud to announce Mantra Mooloolaba Beach as its official race hotel. Mantra has a reputation for supporting major sporting events across Australia and is the obvious choice for visitors competiting and supporting the 7 Sunshine Coast Marathon & Community Run Festival. The four-star beachfront property is 200 metres from the race start and event precinct and is at the heart of Mooloolaba’s vibrant Esplanade and cafe precinct. Mantra Mooloolaba Beach features 178 fully furnished one-, two- and three-bedroom suites each with a private balcony and sweeping ocean or garden views. Ideal for families, couples or conference delegates the rooms are comfortable and spacious ensuring you enjoy your stay. Onsite you will find a variety of dining options as well as many leisure facilities including two swimming pools, a spa, sauna and fully-equipped gym. Designed around a 150-metre tropical lagoon pool, BreakFree Alexandra Beach is located directly opposite the patrolled surf beach and minutes from Mooloolaba and close to the Sunshine Coast’s major attractions. Mantra Sirocco is located directly opposite the beach in the midst of the shops, restaurants and cafes of The Esplanade. All apartments offer balconies with ocean views. Located opposite the beach, Mantra Zanzibar offers stylish East African inspired apartments and ocean views with a range of cafes, restaurants and shops located at street level. Stay with us on the Sunshine Coast! 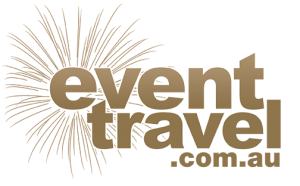 eventtravel.com.au ‘s focus is to provide travel arrangements for people by delivering packages that include flights, accommodation, entry, transfers, activities and unique and special options that cannot be bought anywhere else. They make your life easy – a one-stop shop to take care of everything you need to attend your next event, including they event entry if required. They understand that people are busy and they have already done the research for you, offering a range of options to suit every budget, every need and providing a hassle-free and simple service. Their qualified Event Travel Consultants will save you money and time, whilst making your life easier. And can’t see the exact package you’re after? That’s OK – they tailor to your individual requirements.